I had to process a lot of Word .docx files into readable content for use in a searchable database. Docx files are basically xml files in a zipfile container (as described by wikipedia). Here is my solution, it’s pretty straight forward. Just pass in the server file path to the read_docx() function and it will return the text from that file. Validating Email Addresses is one of the more elusive patterns to define, but this pattern will match 99.99% of all email addresses in actual use today. A further change you could make is to allow any two-letter country code top level domain and only specific generic top level domains. This regex filters dummy email addresses like asdf@adsf.adsf. You will need to update it as new top-level domains are added. This function will return true/false if the email values passed into it validates against the pattern. If you’ve ever used Amazon’s AWS console then you probably know that though sometimes it can be clunky, it has a ton of functionality for interacting with the various AWS services. So when I needed to give one of my coworkers access to one of our S3 buckets, I immediately investigated the laziest option: figuring out how they could login to the S3 console and use that to manage the bucket. The S3 console is pretty great. Uploading, downloading, creating folders, managing permissions, even copying and pasting buckets between files is a snap. If I could figure this out, I would save myself all the work of setting up S3Fox or even worse, writing an interface from scratch. After some trial and error, success! I’ve written a quick guideline on how to do this below. Login here as the owner of the AWS account. Click the IAM tab. This step is optional, but it gives you a nice login URL for your users. Add an account alias in the AWS Account Alias section of the IAM console. Then, your login URL will be youralias.signin.aws.amazon.com. If you don’t do this, your login page URL will be a bunch of random numbers. With IAM, you can create a group that has certain permissions, and then assign users to that group. Or, you can just create users piecemeal, but then you can’t reuse permissions. If you want a group, create it first. Then create a user and assign it to that group. Click the new user you’ve created and then click the Security Credentials tab. On that page, you can click Manage Password to add a password for your user. Without a password, the user won’t be able to login to the AWS console. Make sure your user knows to use the login page from step #2 in order to login — they can’t use the regular AWS login page. You’ll notice your user also has an AWS access key created: API clients using this key will have the same permissions as the user would in the AWS console. Permissions are added either on the group the user is in, or if you decided not to create a group, the user account itself. Click the user or group, then click the Permissions tab. Here you can see which permissions policies are currently attached to the group or user. Click the Attach Policy button. You’ll get a pop-up where you can Manage User Permissions. Here you can select a prerolled policy, use the Policy Generator, or just paste in a custom policy. There are two permissions that need to be added in order for your user to be able to login, see the bucket list in the S3 console, and manage the one bucket you’ve assigned. You’re done. Give the user their credentials and the login page, and then bask in the glory of laziness. As 2015 comes to a close, it seems appropriate to round out a list of the best AngularJS templates that I’ve seen this year. Whether you’re looking to build a dashboard application, a portfolio application, or you are merely looking for a responsive AngularJS template to build your application on, there is sure to be a template suited for your needs. 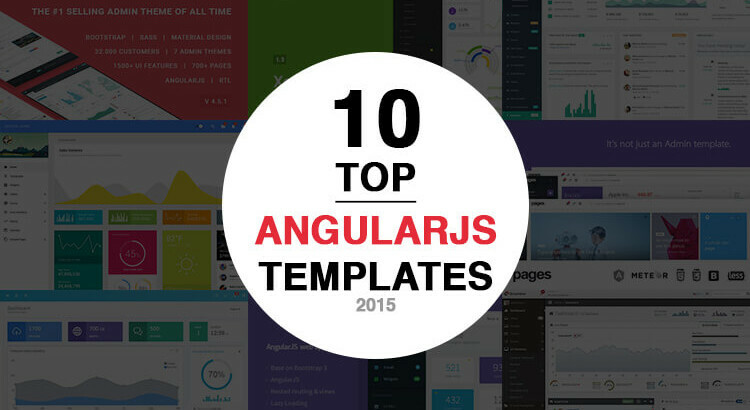 Here are our top 10 best AngularJS templates this year. There are many fantastic templates available on the web, and it is difficult to decide which is the best AngularJS template available. When looking for a suitable template, there are many decisions that you have to weigh: responsiveness, quality of code, design, price, etc. Depending on what web app you are building, the best template for you might be different from that of another web application. This list contains 10 of my favorite templates, and I am are sure that there are many more quality templates available. Metronic is a responsive and multipurpose theme powered through the Twitter Bootstrap and AngularJS frameworks. It is a flexible theme that can be used for many different kinds of applications. Metronic has a beautifully designed flat UI, and works on all major web browsers and on mobile devices. 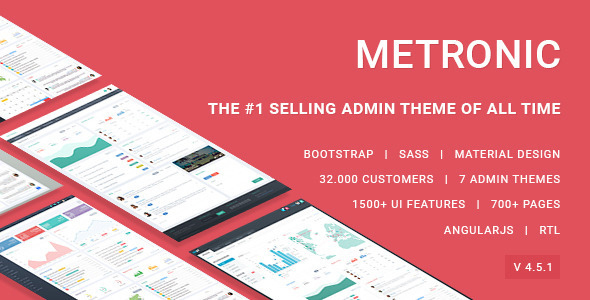 Metronic currently comes with 6 complete admin themes. Metronic’s beautiful UI and flexibility makes it one of our all time favorite AngularJS themes, and is definitely one of the best AngularJS templates available. 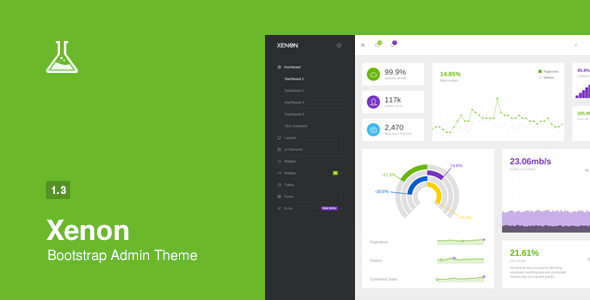 Xenon is a lightweight responsive dashboard and admin template built with Bootstrap. Xenon contains plenty of UI components, layout variants and themes that make up a total of 136 HTML files. Talk about value for money! Despite its large number of files, Xenon practices neat organization of files, clean code, and easily expandable features. Xenon is responsive and retina ready and works perfectly with mobile devices. It is one of the best AngularJS templates available that has almost everything, and is sure to save you plenty of development time when working on a large project. 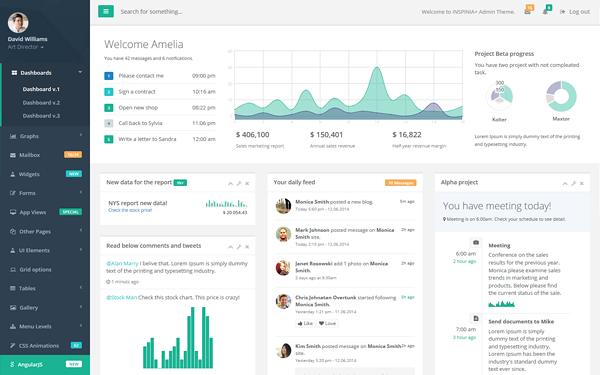 INSPINIA is a premium responsive admin template built with Bootstrap 3, HTML 5, and CSS 3. INSPINIA comes with a huge collection of reusable UI components and features a beautifully designed flat UI. It can be used in a wide variety of applications such as admin panels, application backends, content management systems, and more. INSPINIA not only supports AngularJS, but also many other frameworks such as Ruby on Rails and Meteor, and comes with a seed project for each. It is an easily reusable template that promises continuous free updates, making it one of the most versatile and best AngularJS templates for use in almost any application. 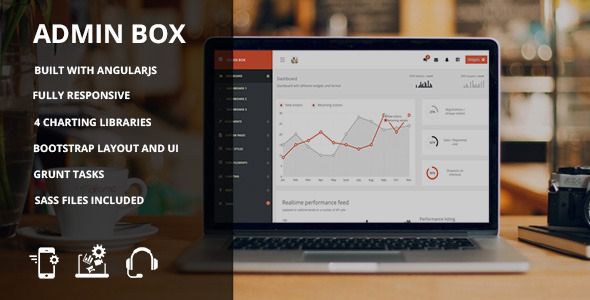 Admin Box is a beautifully presented AngularJS dashboard template. It is powered by SASS and Grunt for easy development, testing and production. Admin Box comes packaged with a suite of features, such as form validation and customization, vector maps, and many more. The Admin Box template also uses SASS files, which makes it extremely easy to customize it to your needs, making it a fantastic template to use for web development. Material is a powerful, lightweight, fully responsive AngularJS template. Material is inspired by Google Material Design and sports a gorgeous UI powered by Bootstrap 3. Material comes with a variety of UI components and form components such as a date picker, color picker, toggle elements, and retina display compatible icons and images. All the components used in Material are completely customized to match Material Design, making it a beautifully cohesive template to start your next application on. 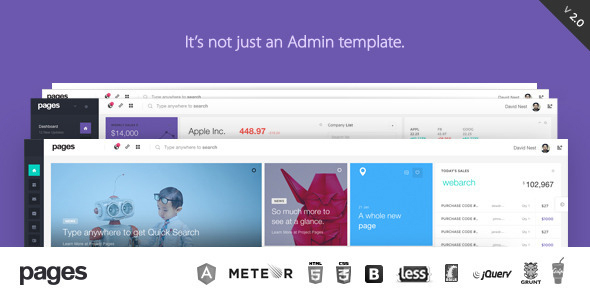 Pages is not just a dashboard template, but a multi-purpose, carefully designed UI framework. It is crafted with special attention to detail. It comes with a large variety of application templates such as a calendar, social dashboard, email application, and many other UI features such as a navigation menu. 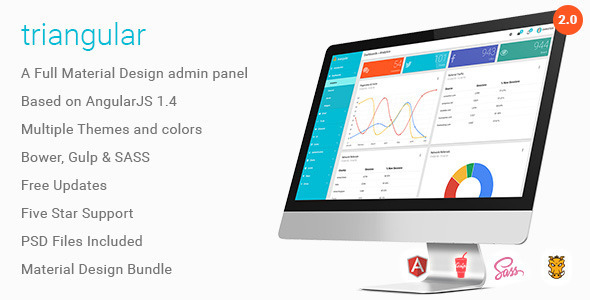 Pages is a responsive AngularJS theme with a beautifully designed UI. Its large number of potential uses and promises of free updates makes it one of the best AngularJS templates available. It’s a steal at $23 on the ThemeForest market. 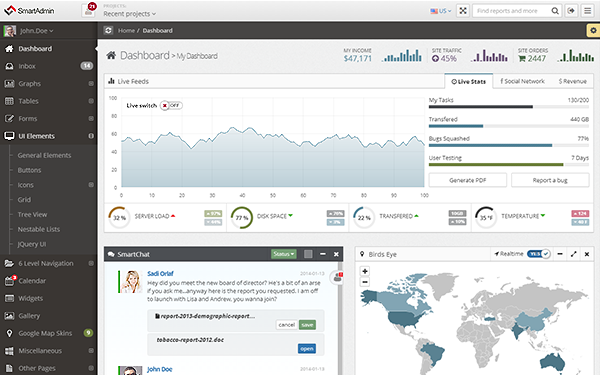 Angle is a web dashboard app based on Bootstrap and AngularJS. This dashboard template contains many ideal components for use in your next dashboard page or web project. Angle contains two dashboard templates: for use in AngularJS as well as jQuery, allowing you to utilise this dashboard template in non-AngularJS apps as well. 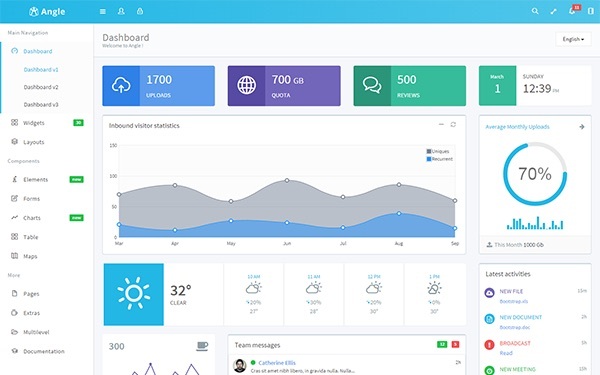 It is a great responsive theme with many useful components, making it one of the best AngularJS templates to build your dashboard project with. 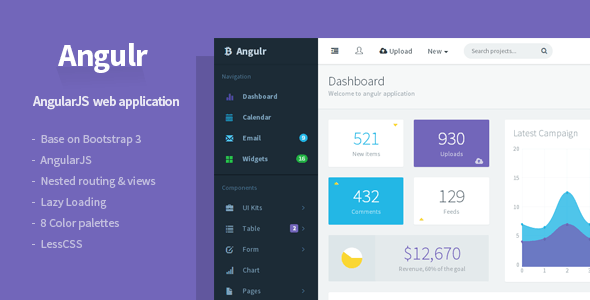 Angulr is a web admin theme powered by Bootstrap 3 and AngularJS. Angulr features nested views, routing and lazy loading making it suitable for large projects. Angulr is fully responsive and works on mobile devices as well as across browsers. Angulr is a very comprehensive template that can be used for a wide variety of applications. It also comes with a single page music application template, perfect for rapid prototyping of your next music application. SmartAdmin is a responsive web application template that contains working variations for multiple web frameworks, including AngularJS. It makes use of Grunt for working tasks and uses LESS and SASS CSS for easy customization, allowing you to easily modify the template for use in your web applications. SmartAdmin comes with over 50 customized plugins and promises free lifetime updates. It claims to be a “chameleon” template that adapts to your needs, and it is built using modern technologies. It is fully responsive and is one of the best AngularJS templates that also caters to other frameworks, should you choose to use it as such. 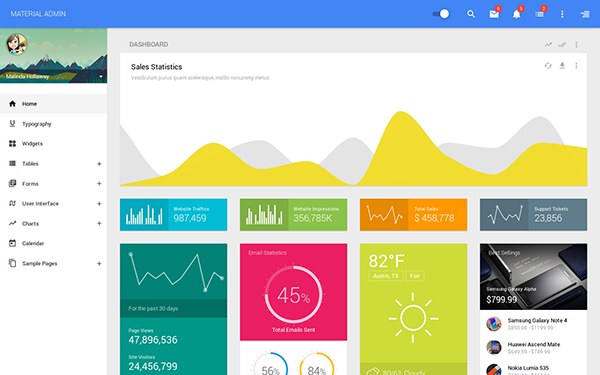 Triangular is a unique Material Design AngularJS dashboard template. It is built from the ground up using Google’s Angular Material Design project. It claims to be the only fully Material Design AngularJS template around. Triangular is a well organized template that uses best practices for front-end development. It comes bundled with 4 premium packages that include tons of Material Design resources, such as avatars, backgrounds, and fonts, making it one of the best AngularJS templates that makes full use of Material Design. First, note that it is not possible to detect whether text belongs to a specific undesired encoding. You can only check whether a string is valid in a given encoding. It’s important to set the strict parameter to true. Check the examples on the iconv manual page as well. Having worked with CodeIgnighter for many years, I’ve crafted the following the following HTACCESS script to meet most CI needs. # | CodeIgniter HTACCESS Rules. # | See /application/config/routes.php for controller routing. # You'll want to verify that the mod is enabled in Apache under Ubuntu. # If not, run "sudo a2enmod rewrite" to enable it. # Restart apache using "sudo service apache2 restart"
# Do not attempt to process these paths with the CI controller. # | BEGIN "Boilerplate" Apache Configs. 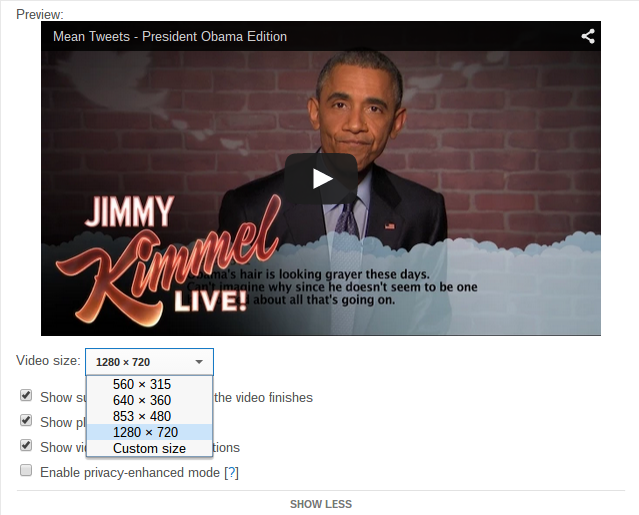 # | Enable/Improve server compression, security, encoding, etc.